A recent article in the Daily Mail and Which?, the trusted consumer watchdog, detailed the outcome of an investigation exposing Laser clinics. The sales tactics used and information given to patients at the consultation were examined at a number of clinics. 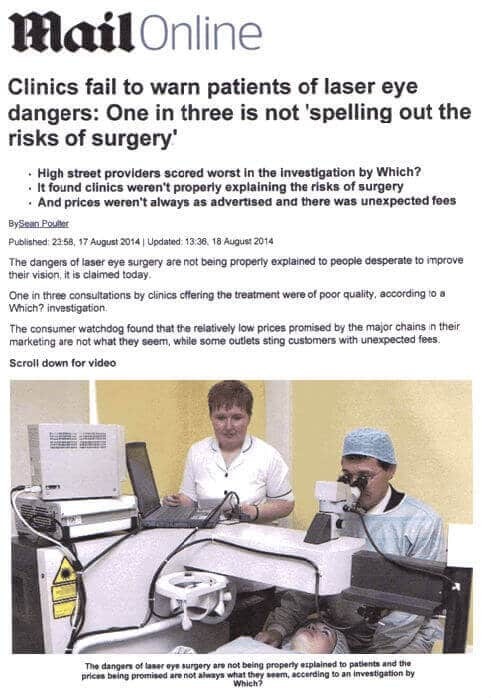 It was found that independent clinics, smaller chains and hospital-based providers scored best and high street chains were the worst and most criticised. In 1989, the first trial for Laser eye treatment was implemented. Since then more than 28 million procedures have been performed worldwide. Laser treatment is safe and FDA approved with consistently high success rates. The article demonstrates the need to make the right choice in regards to choosing your eye clinic before even contemplating undergoing treatment. At AVC we separate ourselves from the tactics used in high street clinics by putting our patients first. We ensure that everyone is fully informed and give them the opportunity to ask Dr Pillai, our Medical Director, any questions. We pride ourselves on being transparent, meaning our prices are fixed and there are no unexpected surprises. We would never resort to pressuring our patients into booking treatment as was found to be common on the high street. We provide a warm and friendly environment where we treat our patients as individuals and not as a number. If you know anyone who would benefit from vision correction treatment help them make the right choice and come to AVC.